Yolanda Oliver of Omaha won $50,000 playing $50,000 Crossword Connect from the Nebraska Lottery. 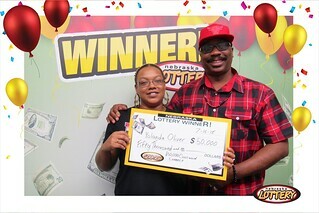 Oliver purchased her winning ticket from Bucky’s #196 at 9645 Ida St. in Omaha. Oliver said the big win didn’t feel real until her ticket was scanned at the Nebraska Lottery office in Lincoln and she could breathe a sigh of relief that she wasn’t dreaming. She scratched the Scratch ticket over the weekend and had to wait to redeem it until Monday. She signed her name on the back and tucked it in the closet for safe keeping. “I’d take it out and kiss it and put it back,” Oliver said. She said the $50,000 will help her to get back a totaled car that she loved. She was recently in an accident with her 1992 Chevy Caprice Classic and sold it to a dealer when she didn’t have enough to get it fixed up. Oliver said she did some research and discovered the car was at a dealership just up the street from the Nebraska Lottery office. “I’m about to go over there and get it back,” she said. As $5 Scratch game, $50,000 Crossword Connect offers players the chance to win prizes from $5 to $50,000. The chances of winning $50,000 are 1 in 198,000 while the overall odds of winning any prize are 1 in 3.59.